Norwex Cloth Reviews: How Do They Really Work? 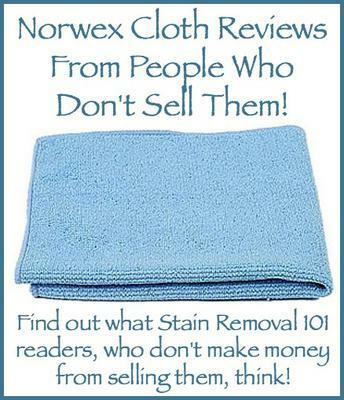 I was first told about Norwex cloth products from a reader, Jennifer, on the site's Facebook page, when we were talking about stinky dish cloths and sponges. One reader stated that "all dish sponges and cloths are no good to use. Try something disposable" because of the stink they can create because of the bacteria they hold. Then, Jennifer responded by suggesting a product to use instead, to avoid this problem but still not have to use something disposable. Or find something that won't stink and is not disposable. I recently discovered Norwex and I am totally in love. I used to use sponges to wash dishes and various rags to wipe counters. They all stink because they hold onto bacteria. The Norwex cloths have silver woven into them so that when you rinse them and hang them up to dry the silver inhibits the bacteria growth while it's drying. I can use my kitchen cloth for a week before I need to wash it! It's so amazing and I am so happy to have found this solution. I will never go back to stinky sponges - ever. Believe it or not, I had never heard of the Norwex brand before, and come to find out they make lots of different cleaning products, so now that it's on my radar I'll be investigating the supplies more thoroughly. This is a brand that sells through consultants, so you can't find the products in stores. Instead, typically you must buy through a consultant, although I did find some listings on Amazon (see above) if you're interested in trying out some of the products without dealing with a representative. and they make some very big and bold claims about them. Please note I have never tried any of their products myself, so I am not endorsing these claims, just telling you what the company itself says. The microfiber cloths that the company makes are different than others because they contain "antibac micro silver." I get a bit confused from the catalog about what this silver is supposed to do. For sure, the company says this silver helps "inhibit bacterial odor, mold, and/or mildew growth within the product." That, basically, is what Jennifer is saying about these cloths, and what she's experienced with the product in her home. It would be nice to not have to switch out cleaning cloths and dish rags as quickly in your home, which currently with normal cloths you have to do every day or two because otherwise they can begin to smell quite funky. However, the idea Norwex also promotes is that you can use their microfiber cloths, plus water, to clean surfaces without any other cleaners at all -- just water. I'm not frankly sure about this, because I've never personally tried the product. However, I would love to hear from others who've used them to share if they can actually get their homes clean with just the cloths plus water, and not use lots of other soaps, detergents, etc. These cloths are way more expensive than many other microfiber cleaning cloths I've seen on the market, so I would also love to know if people think they're worth the higher price. If you've used these, or any other type of cleaning cloth I'd love to hear your review and experience with them. You can share your experiences here, or read other reviews that have already been submitted. In addition, have you used any other Norwex products? If so, be sure to share your reviews with me here since I'd love to hear more about them. Join in and write your own page! It's easy to do. How? Simply click here to return to cleaning cloth. Norwex cleaning products are a product of Norway. As previously shared they do in fact have silver woven into the products which makes them antibacterial. I have tried the multi purpose cloths, hardwood floor system, glass cleaning cloths, car cleaning cloths, and one of my favorite, personal wash cloths- bacterial acne no longer exists. This cleaning system is pricey, however consider never buying another cleaning product, glass cleaner, floor cleaner, acne topicals etc. they quickly pay for themselves! The only downside I feel is having to order them from a rep. That said, they're worth the money and the effort! Recently in a discussion of homemade cleaners on the sister site, Household Management 101's Facebook page several readers extolled the virtues of these cloths. I just became a Norwex consultant because the cloths are so amazing! They are special cloths with silver in them. You get them wet and clean without chemicals! Water only!! And they clean everything! Ditto on the Norwex. You can clean any glass surface with just water and then wipe using their window cloth! Streak-free shine! And their Enviro-Cloths clean 99.9% of all bacteria - just by wiping! They have a silver fibre in the cloth that kills the bacteria. Love their cloths! Thanks for sharing your opinions about these special microfiber cloths. My usual disclaimer in regard to the claims about the 99.99% of all bacteria -- those aren't my words. You'd have to check out what the Norwex company says about these types of claims. I find it an intriguing concept to just clean with water, which is basically what the company claims you can do. I'd love to hear from even more people who've used these cloths to share their thoughts on them here. I was also very skeptical about Norwex when first hearing about it, 'too good to be true'... But IT IS AMAZING! I have not yet came across a product that I don't think is worth the money. It pays for itself; cleaning actually takes less time, no longer use rolls of paper towel to dry my hands or clean and no longer buy any smelly chemicals, Windex etc. They have 4 different colors, so I keep one in the bathroom, a couple in the kitchen, and one for around the house. I also use the mop, which also has the 'silver' and all the dusters literally hold all the dust and not falling all over the place (unlike the Swiffers, which claims it does). It's funny to me being 30 and so excited about cleaning supplies, but I would highly recommend!!! agree these cloths are great for windows! Could not believe how clean my windows are after using the Enviro cloth and the window cloth for cleaning. They are just the best, worth the money, you will save on paper towels in the long run! I love my Norwex cloths. They work so well and definitely do not stink if you let them dry overnight every night. The kitchen towels dry dishes and hands lint free, which I love. Not to mention the crystal clear windows from the Envirocloth and Window Cloth. I have been using Norwex body cloths in the shower in lieu of soap as well as the makeup removal clothes. My skin feels clean, is softer, and it has helped my skin be clearer and has helped my keratosis bumps on my arms. Crazy what a little cloth can do! !